Here’s an update on my May and June goals. My first goal for May was to exercise at least ten minutes a day. I did it almost every day. My goal for June will be the same. My second goal for May was to do cardio at least 5 days a week, and to do yoga and strength training at least 3 days a week each. I reached this goal for cardio, but not for yoga and strength training.. My goal for June will be the same goal. My third goal for May was to take a walk at a park at least three times. I only did it two times, so I will aim for three times in June. Happy June, and good luck on reaching your goals! You did really well last month considering you hurt your leg and then was gone to New York for several days. 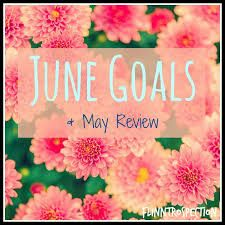 It's wise to keep the same goals for June until you have accomplished all of them! You're doing well! Doing good! Keep it up! It’s wise to stick with the goals that work for you. I also want to get back to doing yoga this month. I will make sure I do it tomorrow! I enjoy reading your goals and how you did with them. Keep pushing and you'll be 100% for June!! Thanks for sharing this blog. Sounds like you did a good job, though! Keep it up. Good luck with your June goals.